In the summer of 2012, I initiated the Dukha Ethnoarchaeological Project. Ethnoarchaeology is the study of living people for the purpose of developing tools to aid in the interpretation of the archaeological record. I am an archaeologist at the University of Wyoming. I normally excavate sites of the first inhabitants of the New World, human occupations that are more than 10,000 years old. In those sites, we find hundreds or thousands of chipped stone artifacts and animal bones. Frustrated with my inability to make sense of spatial patterns in the archaeological record, I was inspired to study living people, people who still lived a traditional nomadic lifestyle, similar to those people I study archaeologically. I wanted to study how nomadic people use their living spaces and how the decisions that people make about how to use space relate to patterns in material residues left in the archaeological record. 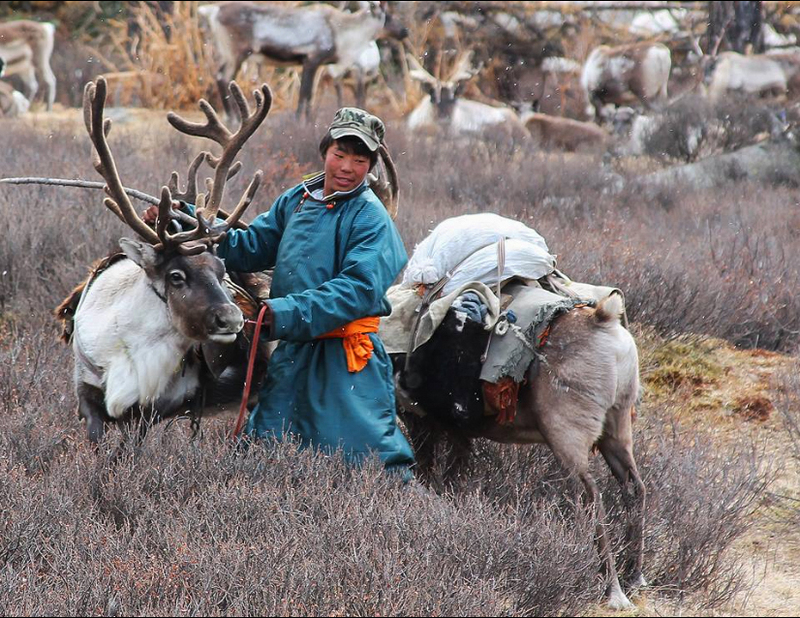 I turned to the Dukha, Mongolia’s reindeer herders who live in in the Sayan Mountains in Khövsgöl Province near the border of Russian Siberia. A young Dukha and his deer. The Sayan Mountains are a cold place, which is why reindeer are able to live there. The taiga where I work, called the “Right” or “West” Taiga, is at 51° north latitude, equivalent to southern Canada. 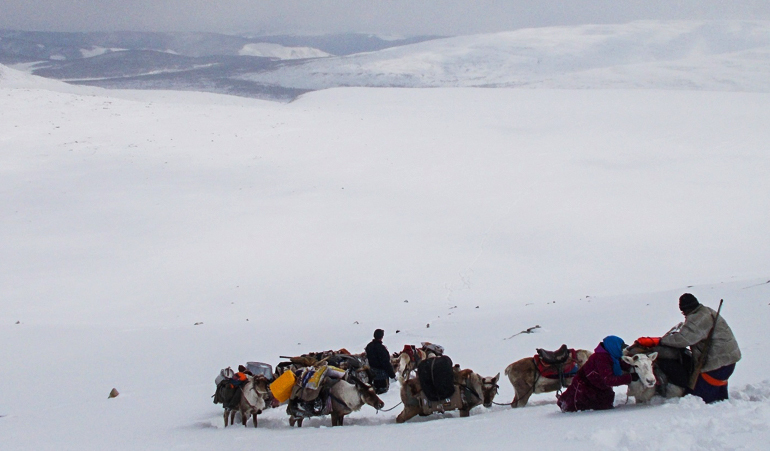 In the winter, nighttime temperatures regularly drop to -40° C and in the summer, daily highs top out near 20° C. The Dukha are ethnically Tuvan and have a tradition of skiing. In fact, Tuvan peoples may have been the world’s first inventers of skiing. That said, in my four field seasons in the taiga, I have only seen one pair of traditional skis. I saw those in a spring camp earlier this year. It seems as if traditional skiing is slowly fading from the Dukha cultural repertoire. My colleague, Matt O’Brien (California State University, Chico), and I purchased two pairs of Altai Hok skis for our fieldwork. We chose them for several reasons, but most importantly because they are short in length. They travel easily whether by plane, vehicle, horse, or reindeer. They are also wide, so they perform well in backcountry conditions. Tsagaannuur. 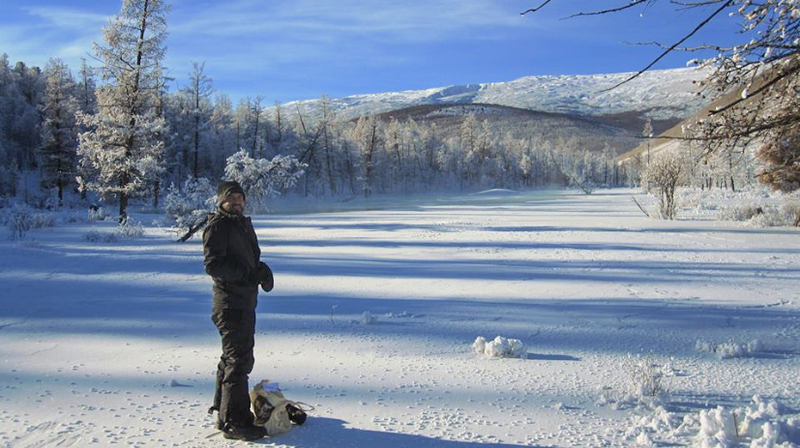 We had arrived to camp two days before and planned to move with a Dukha family into their spring camp high in the taiga. We had a day of rest on account of weather; it snowed for 24 hours following our arrival. The morning of the move, everyone packed their belongings onto deer, and we began the long two day ride into the mountains on the backs of reindeer. Sunlight glinted off of the snowy landscape as we rode into the mountains, and through our 500 m ascent, the snow grew deeper. In the valley bottom of winter camp, only 10 cm of snow had fallen. Where we camped that night in a place called Shamög, the snow was knee- to waist-deep. My Dukha friends made a roaring fire, and we drank tea, and ate bortsag (small pieces of fried dough) and boiled mutton ribs and back. An area was cleared of snow for sleeping. I had my -40° sleeping bag, but I was very happy when Khosbileg, my 18 year old Dukha little brother, put three layers beneath us (including a sheep skin blanket) and two more on top. I slept warm and comfortably under a million stars in a clear dark sky. We knew the next day would be difficult, but we did not know how difficult. Mankhen Pass stood between us and our destination at 2,825 m in elevation. We had to climb another 650 m from our campsite, and conditions were not going to get any easier. At first, our deer handled the snow well, but on a steep climb, I watched Khosjargal’s deer get bogged down in deep snow. Khosjargal is 20 years old and probably weighs 65 kg, too much even for his artic-adapted mount. After prodding his deer to regain its footing and failing, he turned to me and said in Mongolian, “My snow machine is out of gas.” He dismounted and started trudging up hill in waist-deep snow, pulling his deer behind. Adjusting packs on the way up the to the pass. Our next two hours were like this. As we climbed upward, the deer struggled through deep powdery snow and Khosbileg and Khosjargal took turns breaking trail. The final climb to the pass was a challenge. It was very steep, and as we switchbacked up the slope, packs became unbalanced and fell off of exhausted deer. I pulled a train of three animals behind me as I walked up the last 50 m of ascent. There, struggling to regain my breath, I gave Spencer a high five, and said, “Let this officially be the end of winter.” I was so very wrong. The author climbing to the top of the pass. The back side of the pass was worse than the front. The snow was still deep and powdery, and the trail descended slowly. We stayed in the alpine zone for more than 10 km. Exhaustion was setting in from a vicious cycle of dismounting from tired deer, pulling the deer out of the snow, remounting from a base of powdery snow, riding 5 m or 10 m if you were lucky, and bogging down again. 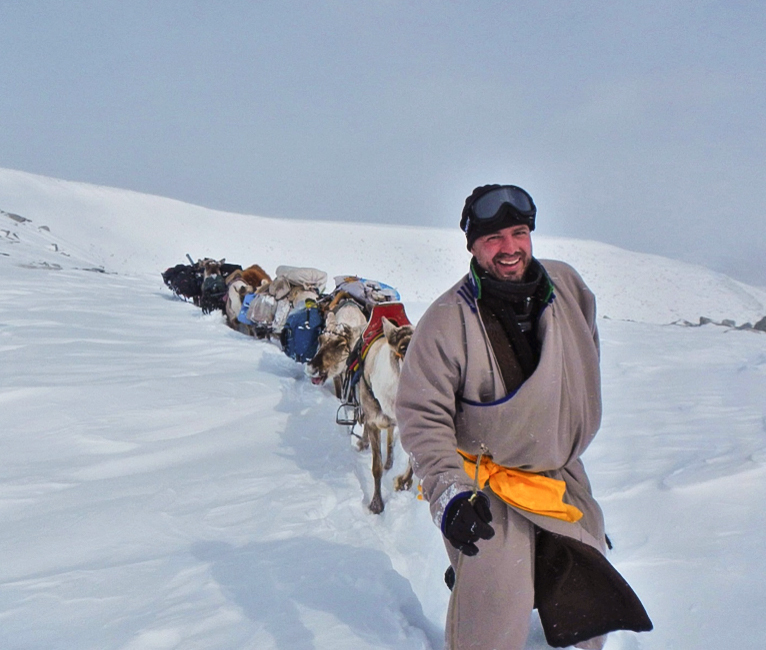 After watching Khosjargal, his son, struggle downward this way for 45 minutes, Bayendalai rode up to me and said, “Can we use your skis?” “Of course!” I responded. Bayendalai is 59 years old. He was born and raised in the taiga. There is no one I would trust more in a difficult situation in the taiga than Bayendalai. I strapped on my Hok skis for the first time. Bayendalai tied two deer to my belt for me to pull behind, and I started skiing. 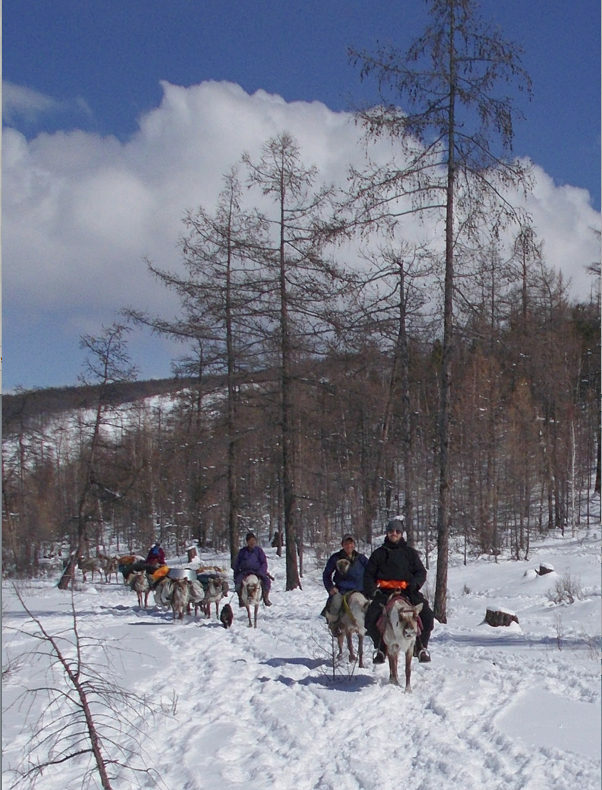 I moved easily across the powdery snow, and the deer behind me, unburdened by my weight broke the trail for the long string of riders and pack animals behind. This is old taiga knowledge that Bayendalai’s sons, like me, were seeing for the first time. A person on skis can easily lead animals for breaking a trail. Khosbileg, Khosjargal, and I took turns breaking trail as we made our way down the mountain. At one point, Khosjargal turned to me and said, “My brother is an idiot”. I turned around to see 18 year old Khosbileg, the jokester, sitting on his deer’s saddle, straddling the animal with his skis. I laughed a much needed laugh on a hard day. Those skis saved us that day. If we did not have them, I think we would have spent a cold night in the snow without a fire in alpine tundra. With them, we made it to spring camp, and slept next to a hot wood stove in a warm dry ortz. 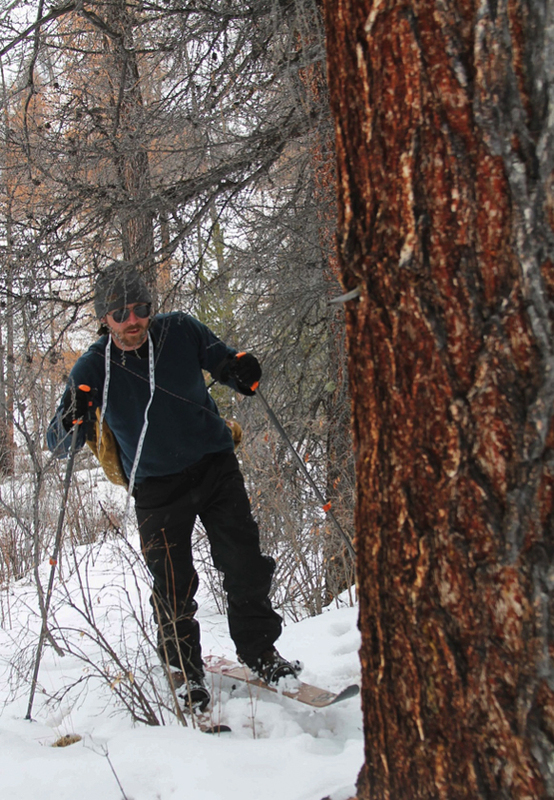 Our Altai skis were critical last spring. 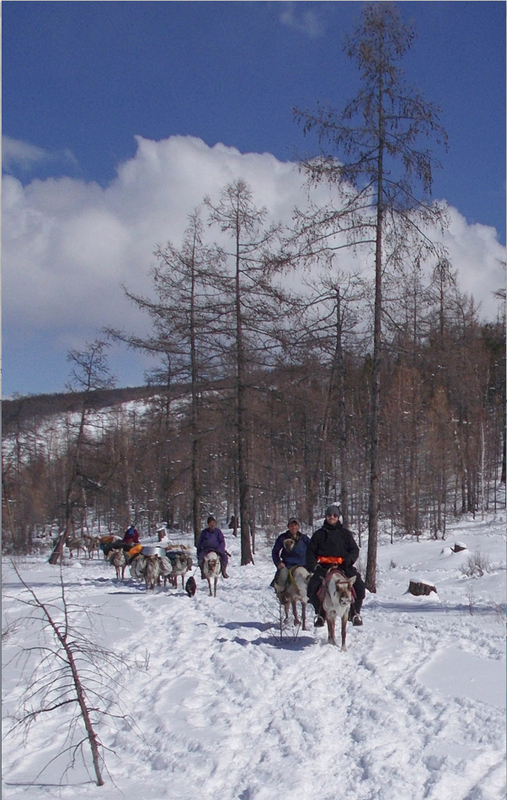 The taiga was snowy through June, and without them, our mobility would have been severely limited. They allowed us to explore and do research beyond the confines of spring camp. 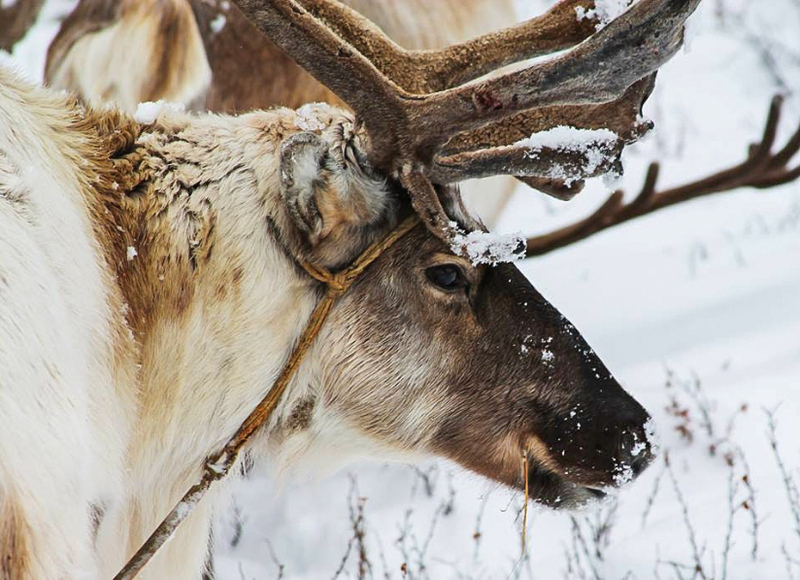 Bayendalai and Khosjargal went on a weeklong foray in search of lost reindeer. They asked if they could borrow a pair of skis. We were happy to oblige. It was the least we could do. 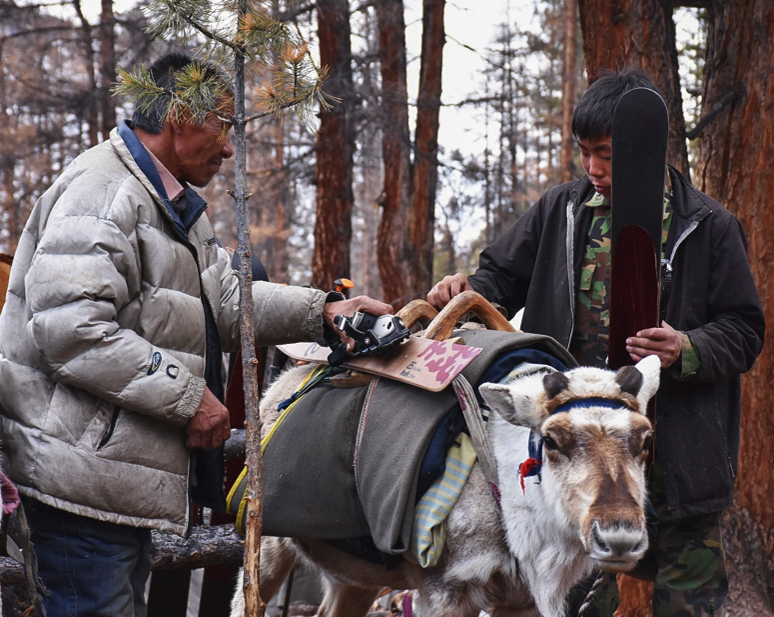 Bayendalai and Khosbileg packing Altai Hok skis onto a pack deer for an extended foray to search for lost reindeer. Wow, first of all, Todd, I wouldn’t recognize you in a million years…it’s been a LONG time! This is Toni Wellemeyer, if you remember me. What a wonderfully exciting trip. Important work and a grand adventure! beautiful pictures, and fine description, narration of your time. Thank you for sharing your very beautiful experience which was so delightful. Fascinating, unique as in one-of-a-kind, informative as in educational. Great story about a people with wonderful traditions. We can learn a lot from them. But the surprise in this story is that they were reminded about the value of their own history – by the Hok skis that saved the day! Great story, but I’m flummoxed about why it took you so long to get the skis on? Sounds like they would have been helpful right from the get go. Love my Hoks, and there’s little I dislike more than trudging through deep snow in my boots. Especially if I’m carrying skis. Very much enjoyed this account and photos. Cool to hear that these unique skis could be so useful. They have yet to be discovered by many!